I love the ease of cooking with sausages, but I am often lacking in inspiration for recipes. Most of the time we just end up eating plain pan-roasted sausages with some variant of German-inspired cabbage and root vegetables, but every once in a while, a winner comes along to provide a much needed change of pace. I’d like to think this kielbasa soup is one to add to that list. After sautéing a few core ingredients, I threw together this creamy, warming soup in three stages using my VitaClay, which speeds cooking time over a regular slow cooker. First the sausages cooked together with a scoop of wild rice, then I added purple sweet potatoes for a shorter cooking time; and finally, I added a dollop of sour cream and a little rice flour slurry for body. The result was full of texture and flavor: rich and creamy, a little savory, a little tangy, and a little spicy. And I admit, I had to resist the urge to throw in a few handfuls of shredded cabbage, but these combinations are classics for a reason, right? 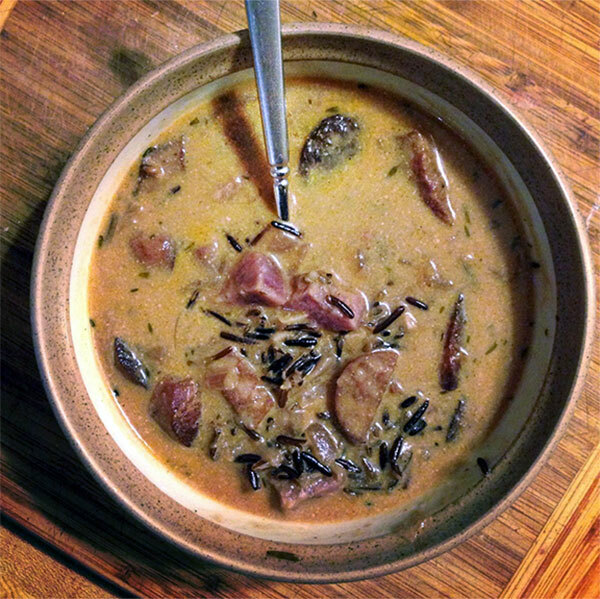 I used a slightly spicy kielbasa from Ranch Foods Direct, a purple sweet potato, shaoxing wine (to sub for sherry), and homemade venison stock to make my version of this soup in my VitaClay slow cooker. If you use another type of slow cooker, or just the stovetop, you may need to plan on extra cooking time for this recipe. Brown kielbasa with onion and garlic; deglaze with sherry. Transfer to VitaClay, add stock and wild rice; cook on “Soup” for 30 minutes. Add sweet potato, seasonings. Worcestershire and ACV; cook for another 30 minutes. Whisk in sour cream and rice flour slurry until homogenous; cook for 10 minutes more. Taste and adjust seasoning, and serve. Variants: This would work well with butternut squash or regular potato, and would also be nice with the addition of some sauerkraut or shredded green sausage. You could omit the wild rice and thickening slurry to go completely grain-free, and omit the sour cream (or sub with coconut milk) for dairy-free. I also think this would work with just about any variety of sausage you care to try, in or out of casings.